Cass County, ND Land Auction - 160± Acres - SOLD!! - Steffes Group, Inc. Cass County, ND Land Auction - 160± Acres - SOLD!! Cass County, ND Land Auction - 160± Acres - SOLD!! AUCTIONEER'S NOTE: Spectacular opportunity to add additional acres to your farm for the 2019 crop year! Square, flat & black farmland located 15 miles north of Fargo, or 3 miles NW of Argusville, ND. This land would be a great addition to any local operator's farm or could be a great investment close to Fargo for those in the market for RRV farmland! 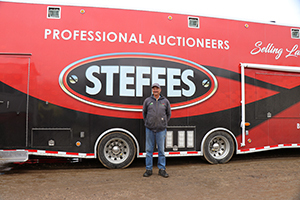 For a detailed Buyer’s Prospectus with complete terms and conditions contact our office at 701.237.9173; or Max Steffes, 701.212.2849; or Brad Olstad, 701.238.0240 at Steffes Group.